In the summer after eighth grade, senior Bailey Bednar scrolled through Instagram as she prepared to go on vacation. She planned to wear a two-piece, but could not picture herself looking any good in the pieces she saw models pull off. She wished for a body like the girls she saw on social media. Bednar started struggling with her weight at a young age. 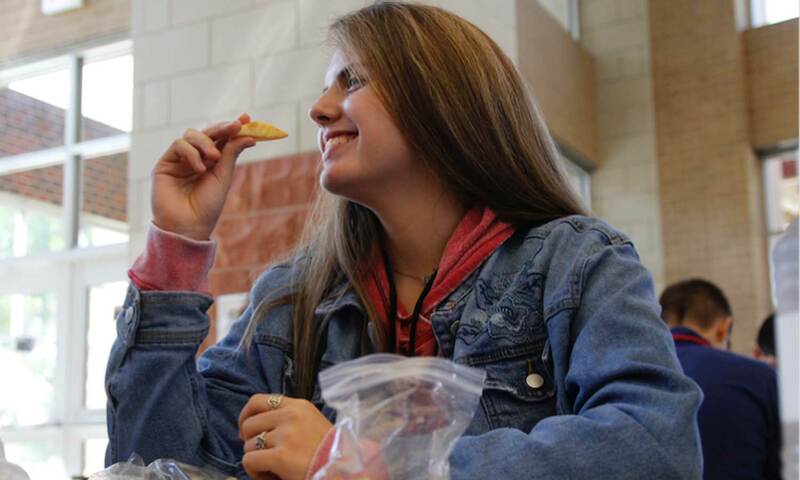 At the start of her freshman year, she changed the habits she felt made her unhealthy. She decided to begin her journey to a healthy life. Throughout this journey, she lost a total of 35 pounds. She began by cutting specific foods, such as fast food. When she realized cutting those foods completely did not work for her, she decided to balance out what she ate. For example, when she ate chick-fil-a nuggets for lunch, she evened it out by indulging in a salad with grilled chicken for dinner. A balanced diet plays an important role in one’s overall health. The human body needs enough grams of carbohydrates, proteins and fats to function properly. Bednar focused on making better choices based on these facts. “You can not call it a healthy diet when you are restricting yourself from [certain] foods. I eat what I crave, but in portions,” Bednar said. Bednar tried low carb dieting, but it did not work for her because she enjoys eating bread and chips. Although Bednar struggled at first, she found a diet that worked for her: a reduced intake of junk food and soft drinks. Junk food contains ‘empty’ calories. Due to the amount of ghrelin, the hunger hormone, found in these foods, they tend to fill people up for a short period time. While transforming a diet altogether seems easier, trimming out one thing at a time can ensure long-term effects. Similar to Bednar’s approach on dieting, track coach and fitness trainer Lacy Beckler agrees that when someone wants to make a diet long-term they have to make it a lifestyle. Beckler also believes in eating real foods as opposed to processed and pre-packaged ones. Beckler also encourages portion control. She does not suggest dieting, but rather an effective weight loss and maintenance method called flexible eating. “I view my body as a machine and the better I fuel the machine, the better the machine is going to work for me day in and day out,” Beckler said. Beckler incorporates exercise in her daily routine in addition to her healthy eating habits. She believes exercise represents a small portion in staying healthy and fit, and dieting makes up the bulk of it. She lives by the 80/20 rule; 80 percent balanced diet, 20 percent workout/training. Dr. Joe Silva from Silva Chiropractic & Nutrition, Chiropractic and Clinical nutritionist, sees patients with back and neck pain as well as those who want to achieve a healthier state through diet and exercise. He helps patients come up with a plan that will change their mindset about food. He also gives them advice on how to make better choices with their current diet. Silva has a hard time getting his patients to realize a pill does not exist to instantly make all dieting problems vanish. They can achieve health wellness through a regimen of chiropractic care and a proper eating plan. The new lifestyle Bednar adopted holds her accountable for what she puts into her body. She warns against counting calories because the amount of calories taken doesn’t matter when one aims to reach a long-term goal. “I don’t think that it should be considered a diet, but a lifestyle.” Bednar said.